Of the 37.2 trillion cells in the human body (excluding microbes), there are about 100 billion, or about 0.2%, that are a breed apart. These supercharged cells are indeed just that, charged to carry electrical signals to communicate with one another. They are organized into a dense and almost unfathomably complex network that uses gobs of energy to act as a command center for everything humanly imaginable. These cells control your breathing, your ability to see, and initiate every movement you make. They are responsible for every idea you’ve ever had, every feeling you’ve ever felt, and every memory you’ve ever recalled. I’m writing of course, of the neuron, the basic cellular unit of the brain. Because of their almost mystical properties, generations of scientists have dedicated entire careers toward understanding how neurons work. Nowadays, we call such devotees neuroscientists, but this wasn’t always so. When our next future Stockholm visitor got started, the basic truths outlined above were known about neurons. But they remained a black box: so little was understood about neuronal insides that neuroscience wasn’t yet a distinct field in the mid-1950s and early 1960s. 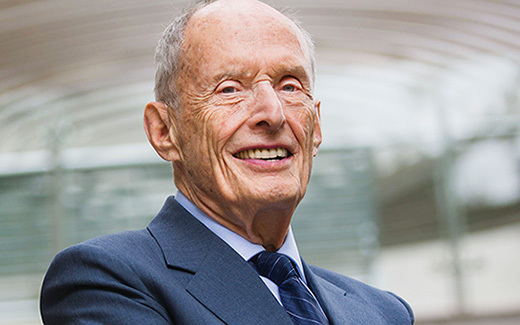 For a newly minted PhD named Paul Greengard, this soon became an inspiring frontier. Trained as a neurophysiologist at Johns Hopkins, Greengard was thoroughly grounded in the electrophysiological school that viewed neurons essentially as living electric cables. In other words, everything important about the brain could be explained through an electrical understanding of how neurons communicated with each other at short timescales. By understanding the biophysics of a firing neuron, it was believed that a largely complete understanding of the brain was possible. And yet, neurons weren’t inert conduits: to the biochemists, they contained scores of unique enzymes and molecules that at first glance had little to do with the rapid electrical wizardry for which neurons were famous. As living entities, they were likely much more complicated than electrophysiologists believed. Not surprisingly in this situation, neither side took the other seriously. One feature of neurons as cells caught and kept Greengard’s attention: neurotransmitters. In the normal rapid communication between two neurons, an excited neuron releases specific molecules to stimulate a neighboring neuron, a bit like passing a message with a direct handshake. This fast synaptic transmission as it was called, was carried out in milliseconds. But there were dozens of other neurotransmitters that appeared to act much slower, on the scale of dozens of milliseconds to seconds, sometimes minutes. This slow synaptic transmission presented a bit of a puzzle. No one knew how it worked, or largely what it was for. Greengard’s great insight was to pay attention to the biochemists. Starting from the premise that a neurotransmitter was a small chemical messenger between two cells, Greengard was encouraged by work with hormones, as a similar form of cellular communication. What made hormones remarkable was their ability to act at long distances, a hormone made in the pancreas could travel through the bloodstream and instruct a distant liver or muscle cell. Greengard hypothesized that neurons might be using similar principles, without the long distances. It was a bit like saying that in a world where quick handshakes were king, neurons were also using phones, fax and email to talk to one another. The early neuroscience community was skeptical that any long distance communication was needed in a fast synaptic transmission world, but Greengard had a decisive edge. He knew from the biochemists that when a hormone reached its target cell, a specific enzyme called an adenyl cyclase was activated to make a molecule called cyclic adenosine monophosphate (cAMP), and both the enzyme and cAMP could be reliably measured. Then at Yale, Greengard and his first postdocs tested to see if such an enzyme existed in the brain that could make cAMP. To their surprise, they found that the adenyl cyclase levels were not only higher in the brain compared to other tissues, but that a slow acting neurotransmitter called dopamine was needed to activate the enzyme. This was a first peek inside neuronal machinery, and it confirmed that the signaling that went on inside of neurons was consistent with other cell types. Suddenly an entirely different layer of communication and regulation of neurons was on the table. Starting with a dopamine-sensitive adenyl cyclase, over the next three decades (and persisting to this day), Greengard and his laboratory, in no small part, created much of molecular and cellular neuroscience by charting the order of intracellular events triggered by a neuron engaging a neurotransmitter. First with biochemistry and neurophysiology, and later with molecular biology and mouse genetics, the Greengard lab showed that these slower signaling pathways didn’t replace the fast communication between neurons, but rather they modulated them: they acted like the knobs and dial settings that enabled the brain to run smoothly. These discoveries had enormous implications for a variety of neurological and psychiatric diseases associated with abnormal dopamine signaling, from Parkinson’s disease, schizophrenia, ADHD, and drug abuse. Molecular explanations of how drugs worked on the brain were now possible, not to mention inspiring whole new avenues of therapeutic intervention. One might expect that as the neuron gave up many of its secrets, fewer would have been drawn to it. On the contrary; because of the efforts in Greengard’s lab, the neuronal muse continues to inspire current and future generations of scientists. Mystery yields to awe. This entry was posted in Campus Life, Current Articles by Guadalupe Astorga. Bookmark the permalink.